Car-free housing estates should be built in the future to allow children to play outside more, a debate attended by assembly members will hear later. The proposals would help cut obesity in children who are unable to play in traffic-clogged areas, Play Wales and transport charity Sustrans say. It envisages that any parking in the new developments would be limited and situated away from people's homes. The debate will be chaired by Children's Commissioner Keith Towler. Between 1973 and 2006, the proportion of children playing on the streets fell from 75% to 15%, research for Play England shows. Sustrans and Play Wales are calling on planning authorities to lead the UK in creating housing which gives a high quality of life for all its residents, particularly children and young people. 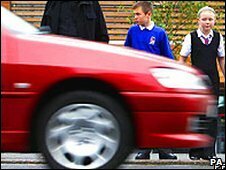 Lee Waters, director of Sustans, which promotes sustainable transport, said: "The lack of opportunity for children to play safely in their own street is causing an obesity epidemic which puts Wales near the top of the world's fat league tables. "Too many urban areas are clogged by traffic when they could be safe public spaces where children can play safely outside their front doors and travel independently." Marianne Mannello, assistant director of Play Wales, a charity which promotes children's right to play, said: "Play Wales recognises the rising concern over children's health. "Time, space and freedom to play outside may have diminished but the contribution these factors can make to children's self-reliance, emotional and physical resilience, and their sense of inclusion and participation in their own community remains unchanged." The proposals will be debated by ministers, building contractors and architects later. The event will hear experts, including Minister for Sustainability Jane Davidson AM and Millennium Centre architect Jonathan Adams.